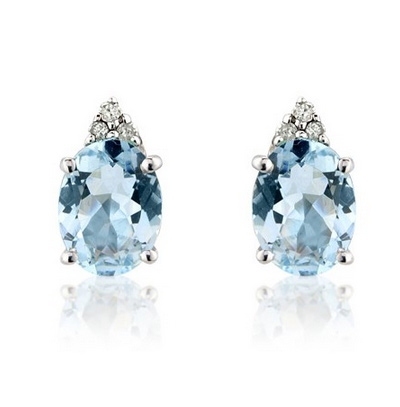 These beautiful Aquamarine stud earrings feature single oval cut gems in solid 9k white gold claw settings with diamonds. These earrings feature standard post and butterfly fittings for pierced ears. Beautiful and versatile with the delicate colour of the ocean and the Summer sky. Aquamarine is one of our most popular stones and the birthstone for the month of March. Delivered free with quality gift packaging, authenticity certificate and a 12 month manufacturer backed guarantee.